New claims have suggested Whitney Houston was seen “drinking considerably” for at least two mornings in the week before her death on Saturday. It is claimed that Whitney Houston, who was just 48 when she died, was seen ordering drinks at the bar at the Beverly Hilton Hotel before 10:00 a.m. on both Wednesday and Thursday mornings. A source revealed to CNN that guests in Beverly Hilton hotel had heard Whitney Houston complaining to the bartender about her drinks being “watered down” or containing “too much ice”. 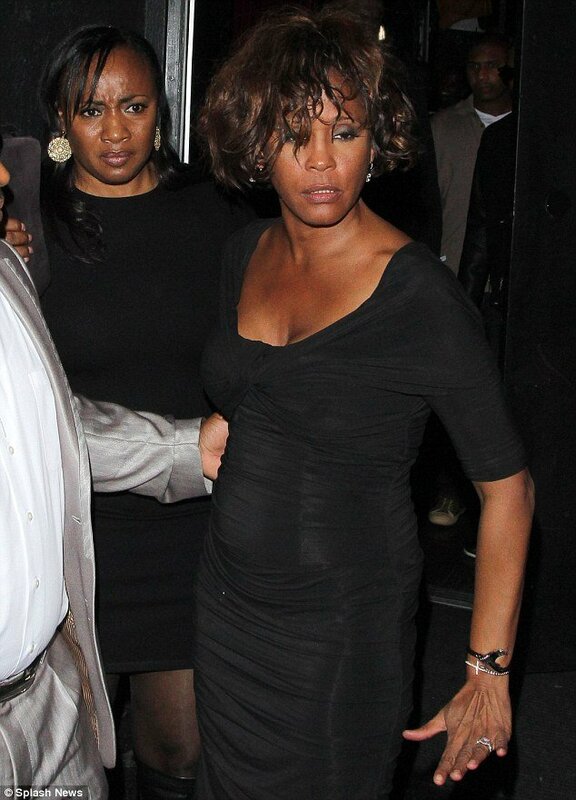 The source added that some of the guests later complained about Whitney Houston’s “erratic” behavior, saying that her disheveled appearance and odd clothing choice led to her appearing intoxicated. However, Whitney Houston’s close friend Kelly Price, with whom the singer was seen partying just two days before her death, insisted she noticed no erratic behavior when the pair spent time together at the Tru Hollywood nightclub on Thursday night. Kelly Price said in an interview on ITV’s Daybreak this morning: “I don’t know anything about her not being in a great frame of mind. I’ve said so many times that she came and she was happy and she beat me to my own party. “She was happy to pose for the press, she was waiting on me when I got there and we had a great time that night. Kelly Price added that she was so shocked when she was first told of Whitney Houston’s passing that she had hoped it was a hoax. Kelly Price said: “I was shocked, very hurt, I’m still very hurt. In my heart and in my mind I was hoping it was a crazy internet hoax. As much as I hate them, I would have given anything for it to be a hoax that time. “I haven’t fully been able to accept it. I need to find a way to have some closure for myself. Meanwhile, plans to broadcast Whitney Houston’s funeral live on television and online have been revealed. After it was confirmed the funeral will take place on Saturday at the Fairview Cemetery in Westfield, NJ, Whitney Houston’s publicist Kristen Foster announced The AP are allowed to film the service and stream it on their website, with some other broadcasters also taking the footage via a satellite.